How can we explain the breadth of the mobilization of academics against the plan to modify their status? For philosopher Vincent Descombes, it is the collective identity of the teaching body that is being injured by the current reforms, as well as the very definition of the university as a social form. This article is a translation of a talk given by Vincent Descombes in his research seminar on 16 February 2009, on the occasion of the “Let’s Change the Program” initiative by which some of the teachers at the EHESS (Ecole des Hautes Etudes en Sciences Sociales) supported the movement among academics against a government decree to change their status. My intervention bears on the following question: can we speak of a collective identity specific to a teaching body? Would something be missing if we did not recognize such an identity? I will argue that the authors of the decree did not foresee the reactions they were going to provoke because they do not realize that professors insist on forming what is called a teaching body. I will begin with a brief evaluation of our conjuncture. As we know, a conflict broke out between the government (which was trying to implement a decree aimed to modify the status of “teaching-researchers,” also called the “Pécresse decree”) and the immense majority of persons concerned by what was announced as a reform of their statuses: both university professors and researchers in the major research institutes. One characteristic of this conflict that surprised all observers – and the actors themselves – was the solidarity, which endures for the time being, of the opposition front formed by academics. This firmness is all the more remarkable as one is accustomed to seeing French academics ready to ready to endure all kinds of humiliation. This unexpected firmness signals that the government has unwisely touched something deep. I am proposing this interpretation: the decree, in both letter and spirit, frontally attacks the basis for the collective identity of the teaching body. Behind this decree and this conflict, we find two facts: 1) the shock caused in France, at least among the ruling class by the rank given to French educational establishments in the “Shanghai ranking”; and 2) the resultant challenge to the French consensus on the organization of higher education. What is the “Shanghai ranking”? First of all, what got into the folks in Shanghai that they are giving grades to academic establishments throughout the world? In 2003, Jiao-Tong University in Shanghai refined for its own usage, rather roughly (and assumed as such), what it called an “academic ranking of world universities” with a view to responding to a constraint everybody felt, the phenomenon of globalization. The purpose of this ranking was not to give prizes for excellence to the most meritorious establishments, but rather to classify the world’s universities so as to be able to send Chinese scholarship students abroad in the best conditions. For decades, if not centuries, the French consensus concerning the organization of higher education has been the same: everybody in France accepted a system that resulted in a French student – especially if brilliant and capable of sustained studies – able to bypass the university curriculum properly speaking (and its normal conclusion, a doctorate) and instead obtain – to general satisfaction (his or her own, that of families and employers) – a title delivered by some grande école. This student might thus have only a vague idea of the university curriculum in the proper sense: being exposed to the diversity of fields of knowledge and to the life of research. That is, unless his école tried to correct his purely specialized destination – e.g. train as some kind of engineer – by adopting some activities of a university type, like research, or even the preparation of a doctorate, but in this case the école would be competing – in scarcely loyal conditions – with academic establishments that never had the same material resources or the possibility of selecting their students. On top of this first anomaly came a second after WWII: research activities using public funds were confided to enormous national organizations specialized in research alone. These two French anomalies from what happens normally everywhere else are responses to historical, political, and ideological circumstances. These circumstances are well known, and I will not go over them except to emphasize that the matter goes well beyond the actors in the university system. They have resulted in a national consensus: there are two possible paths, one where selection is made upon entry in well defined criteria (preparatory classes, competitive examinations for the écoles), and the other in which this selection is made as late as possible and in the most impersonal and least visible manner possible, by preference in an obscure interval that separates the university experience from the job market. How should we react to the fact that our educational establishments are ranked poorly in the awards established by the University of Shanghai? Two policies were possible. First, we could accept its questioning of our way of doing things, by aligning ourselves gradually and gently to the extent of our financial means, with the normal model. To follow this policy, the government would have to work to produce a new consensus, at least over the medium or long term goal: to reunify the university with those of the grandes écoles that desire to figure in the international rankings, and with research. Obviously, this goal presupposes considerable improvement in the working conditions in the universities. Or else we could make a pretense of so aligning ourselves, by adopting a two-faced system: one face for the exterior that would permit moving up in the ranks of Shanghai or elsewhere, and another – for us – that would leave us free to keep an internal organization that conforms to our habits. The government chose neither of these two solutions, but rather a third option that appears both sterile and unfair: making responsibility for the bad rank of the French in the Shanghai awards rest on university academics (not on political leaders), as if they had chosen to undergo the competition forced on them by the grandes écoles and as if they were the authors of the bureaucratic organization of French scientific research. If you read the decree, it would seem that the most urgent measure to take in our humiliating situation is to mobilize negligent professors and dozing researchers, by a whole system of individual incentives (prizes, bonuses, gratifications, penalties), as is currently done in industry or business within a single corporation. People speak of “reforming” the university as if this term should be accepted without proof. To reform actually means to “put an end to abuses”, to redress things that have been deformed, to give back to our community its initial purpose, one that fulfills its mission. Any organization should of course accept being reformed, under pain of sclerosis or corruption. But is this really the issue here? Do abuses and drifts, negligence and laxity on the part of professors who teach there, really explain the bad state of the French university? Are they really responsible for not having triumphed over what I called the French consensus, the consent to the anomalies that penalize our university system? It is too evident that they suffer from this system, not profit from it. Does this mean there are no abuses to be reformed? Of course there are. People say (rightly) that one of the scourges of the French system is localism, feudalism, favoritism (in recruiting). Would the new organization be able to correct these abuses? Quite the contrary, it is going to aggravate them since it gives uncontrolled power to the presidents of universities, as everybody quickly perceived. Consequently, the decree’s project is by no means a “reform” plan; its goal is not re-establishing the university in its proper mission, but rather “mutation” – exactly that, which when realized has provoked its collective rejection. The brain-stormers who defend the ministry’s line say that this is a mutation in the direction of autonomy and maturity. The necessary mutation will consist of removing professors from their state of infantile dependence on the state, and the best way to do that is to enter into the adult world of autonomy and competition. But since when does putting employees within a large organization into competition with each other give them any degree of autonomy? Where is the competition they are talking about if everybody must compete before the same giver of orders? One would have thought they had understood at least one thing about adult life, which is that a situation of healthy competition presupposes it occurs between people who have something to offer, on the one hand, and between those who have demands to satisfy, on the other. If a government should someday introduce elements of competitions into the French university system, it should create the conditions for a double competition. It is a joke to speak of “autonomous universities” when they draw all their finance from a negotiation with the ministry around “contracts of objectives”. They are perhaps in competition with each other, but the state itself is in competition with nobody. The same is true of the idea for personnel incentives distributed to academics by their presidents: how could these academics in turn seriously put their own presidents into competition with each other, as is commonly and ordinarily done in the United States? One conceivable measure that might go in the direction of healthy competition would be to abundantly distribute generous scholarships to doctoral students, scholarships that would be awarded nationally: they might thus make the universities all over France compete for these scholarships, and if their financial contribution to the establishment were sufficiently significant, that would be a powerful motive for all to make sure they made good choices with respect to the recruitment of professors. Human resources or teaching body? The notion of a “teaching-researcher” (enseignant-chercheur) also appears problematic by the division it suggests between the act of teaching and the act of doing research. The hyphen stresses more than erases the separation. Moreover, this impossible division is presupposed in the law when it claims to count the hours corresponding to teaching and those corresponding to research (according to an evidently imbecile principle of half-and-half). This division is profoundly foreign to the very idea of a university course and perhaps has no other meaning than responding to some regrets about the second French anomaly signaled above. But Beaud stresses that the work preparatory to giving course is counted among the hours under the heading of teaching, not in those of research. The misunderstanding is enormous. Visibly, “research” evokes for the writers of this law something like manipulations in a laboratory likely to result as quickly as possible in industrial patents. The academic – tricked out as a “teaching-researcher” – is treated as a sort of Jack-of-all-trades, sometimes a cook, sometimes a steward. The university professor is a hybrid being, sometimes doing research far from his students, sometimes teaching courses far removed from her research. But perhaps the people who write these laws have never had occasion to follow a course worthy of the name? In this respect, Beaud makes several illuminating comments. He first protests, as he should, against splitting the university academic into teacher and researcher. He then protests the manifest desire to amalgamate with these two functions a third, that of management administration. In fact, the law plans to promote a new definition of the occupation. Our job, we learn, has three components: teaching, researching, and administrating. This way of defining the university occupation betrays a surprising ignorance of our work – or else perhaps a conscious ambition to metamorphose it. The latter case explains everything: it is the very existence of the job of professor that is an abuse, and that must be stopped by a reform! To get out of the confusion, Beaud explains, we must stop putting all these functions on the same level and pose the problem of hierarchy. Not only are teaching and research not really separable, not only do these functions also include other tasks the law does not seem to know about (like supervision of theses and participation in dissertation juries) but other functions that are mentioned (administering the university, participating in evaluating committees) are necessarily annex functions, whereas the law insists on mentioning them on a par with what is at the heart of the job. “The decree repeats a previous error by refusing to make a hierarchy of the missions of academics, and this contributes to making commonplace a job that might be claimed by […] any person having a certain professional experience and/or ‘media visibility’.” (Beaud, p. 12). Is making a hierarchy not arbitrary? How can Beaud see it as a measure of intellectual health? But obviously this is not a matter of evaluating the personal merits of title-holders of these various functions, nor of denying the evident necessity that all functions be fulfilled as well as possible. Moreover, this problem of hierarchy does not pertain to remuneration or prestige, or what the U.S. more correctly calls “compensation” corresponding to duties; it is undoubtedly normal for academics who have gone into administration to receive such compensation. In reality, the hierarchic problem posed by the definition of the professor’s job is quite simply a problem of purpose and of signification. What should come first in the definition of what an academic is – what he or she is called upon to do – and what can come only second? Assuredly the function of management is very important from the standpoint of the good operation of the establishment, but it can only be subordinate. Professors do not give courses so that there will be an administration and managers, but the inverse. I insist that the equal dignity of persons is not at issue, but rather the meaning of the collective activity that involves professors faced with their students and managers faced with their professors. Here we might think of what the philosopher Charles Sanders Peirce wrote: “The ruler of a nation depends upon his cook and his secretaries. That does not place him lower than they, but higher.” (Collected Papers, vol. 6, § 324). Beaud finishes his note by giving two references that will allow me to introduce the notion of a collective identity among professors. He first cites an anecdote reported by Simon Leys in a little essay on the idea of the university. We are in England. A young minister of Education who has come to visit a great and very ancient university is addressing the professorial body gathered to hear him: “Gentlemen, as all of you here are employees of the university … ” Quickly one of the academics interrupts him: “Excuse me, Mister Minister, we are not employees of the university, we are the university.” Leys concludes that the administrators, by correct doctrine, are not employers of a personnel that would include professors among others, but they are indeed at the service of the university, which defines itself by its professorial body. Is this conclusion “corporatist”? In any case, it is literally exact: our British colleague did not raise a debatable claim, but confined himself to recalling what is historically the very definition of the word universitas: the union of professors. The sole point that might give rise to a debate is whether there are reasons today to modify this definition. For what matters here, note the vigorous affirmation of a “we” that gives a body and a place in the world and in history, to what might pass for being only an “abstraction”, a purely nominal entity: “We are the university.” Monsieur le Ministre, what you want to say about the university, you ought to say to the teaching body of the establishment concerned, for you are speaking of our demands when you mention the demands of the university on those who serve her, not the duties that we might have with respect to a firm of which we would be the employees. Beaud ‘s other reference comes from a book by Albert Hirschman that distinguishes three possible relations of an individual to the institution of which he is a member: an attitude of loyalty if he feels at home there, an attitude of voice if she has criticisms to make of it, an attitude of exit if he has lost any hope of seeing it change. I will come back to these three possibilities, for they indicate three ways for an individual to feel (or not) a real part of a group that exceeds him or her by its volume of activity and especially by its history. Who is the university? Who can say, “We are the university”? This question is about a definition of what makes the collective identity of a university. “We are the university,” say the professors to the British minister. Is there not a “corporatism”, coupled perhaps with something out-of-date, in claiming to identify the university with only a portion of its “personnel”? I suppose that everyone understands “corporatism” as the conduct of a small group defending its monopoly or unjustified privilege to the detriment of the general interest. To the good question “What would university corporatism be?” I would answer that it would consist of organizing an artificial scarceness of the population of PhD’s, in such a way as to give an advantage to those who already possess this title, and I am going to rely on a course given by Durkheim, a course professed in 1904-1905 and published under the title L’Évolution pédagogique en France. I note here the general opinion that we are not observing today a shortage of PhD’s (as there is a shortage of taxis in Paris), but rather unemployment or under-employment of young doctors. In this course, Durkheim devotes a long analysis to what he calls the “creation” of the very idea of a university-as-institution. He stresses that this is a specifically medieval invention. What appeared between the 12th and the 16th centuries, first in Paris and Bologna and then throughout Europe, was the “the most powerful and more complete scholastic organization that history had known” (p. 188). We witness the “constitution, in a determined point of the European continent, of a vast teaching body [my emphasis], anonymous, impersonal, and consequently perpetual, including hundred of masters and thousands of students, all associated with the same work and subject to the same rules” (p. 189). Durkheim was not yet using the language of collective identity as we do, but that is what he is aiming at. As Joël Thoraval remarked during a discussion held in my seminar at EHESS, this “teaching body” possesses remarkably encompassing properties: it includes teachers but also their students. This property will be illuminated in Durkheim’s analysis, which puts the accent on the following points. 1) The university is an historical creation, which means that the institution that made its appearance between the 12th and the 16th centuries is not the imitation of an ancient or Carolingian model. It is a collective creation, and therefore anonymous. Durkheim takes care to distinguish in his description between the two faces of the medieval invention: on the one hand, particular and circumstance aspects, related to the local context; and on the other, the University as such (Durkheim uses the capital letter) “that is not the institution of any one time or any one country,” since this institution “was perpetuated until our day and the organization that characterizes it was propagated throughout Europe” (p. 108). To refer to the University as such, the very idea of university, which is an excellent example of what Castoriadis called an “imaginary historical signification”, I will henceforth use the European idea of university. European idea, for it is older than nation-states. Durkheim explains that you have to study this creation in its first (medieval) state precisely to understand what the university could and should be today. For example, in observing that the medieval University was international, we understand “that is normally what a University should be even today” (p. 102); it should have the same international vocation: “Current Universities should be for current Europe what the Universities of the Middle Ages were for Christian Europe” (p. 103). 2) What is this European idea of university? Is it a universitas magistrorum et scolarum (“a university of professors and students”), the word universitas referring to any collective form of organization with a view to a determined purpose (p. 106-108). The idea of university all over Europe is “of hundreds of professors cooperating to organize common teaching that is addressed to thousands of students” (p. 109). Durkheim stresses the flexibility and genius proper to this social form. By its long history, it has proved that it can be transposed to all sorts of social and historical milieux. Our scholarly life, he said in 1905, “continues to flow in the watercourse that the Middle Ages had dug for it” (p. 189). Durkheim judges that this institution has weathered time well. And here he was considering only the French case (one of the least favorable); this would have been ever more true if he had spoken also of the old universities of England or Germany – and if he had measured the present vitality of either kind for the way in which they have been able to conserve or not the initial idea, which is, once again, that of a collegiality defining a teaching body. 3) Consequently, explains Durkheim, the medieval idea of university is a corporative idea (we know that for Durkheim, who did not know the unfortunate aberrations of the authoritarian and corporatist regimes that appeared between the world wars in Southern Europe, the word “corporation” refers to something like an intermediate body necessary for the vitality of the whole society, and there is nothing pejorative about it). I know that in referring, along with Durkheim, to the Middle Ages and its corporations, I will be exposed everywhere (except at the EHESS, where the act of citing the past experiences of a collective invention cannot arouse the accusation of being attached to the past) to all sorts of futile and ignorant rejoinders: about corporatism, about returning to Middle Age concepts and thus the total opposite of our modernity… To which I would have to respond: our modernity, yes, but which one? The one that speaks of “human resources” or the one that speaks of education for everyone? 4) What are now the specific faults and pathologies of this type of organization? These are indeed linked to such collegiality and Durkheim does not fail to comment on them: corporatism, traditionalism, in other words remaining closed off from the surrounding world and from novelties as well as from youth (p. 191). And we see, there are obviously pathologies inherent in the very existence of a university organization of teaching, just like the risk of breaking a leg is inherent in the very practice of winter sports. 5) Any grand social form, in good Durkheimian doctrine, should be represented in a solemn collective act that recapitulates it. In the case of the university, explains Durkheim, the act that figures the meaning of the whole institution lies in the ceremony by which the title of doctor is discerned to someone who has been judged worthy of it. He cites (p. 151) the famous formula: dignus est intrare. People often remember Molière’s witticism: “Dignus est intrare in nostro docto corpore” (“he is worthy to enter our teaching body”). However, explains Durkheim, this formula encapsulates the whole spirit of the university institution. When applied over time, it gives rise to a hierarchy, the series of “degrees” (in other words, academic grades) that precede the doctorate. The temporal perspective of a curriculum re-establishes a promise of equality among members of the body: the students, who still have everything to learn, are already incorporated into the institution inasmuch as they prepare themselves to eventually receive the title of doctors (by passing through all the intermediate grades), and then to move up through all the degrees that are distinguished within the body. Any professor has been a student, any student should be treated as the future PhD that he is destined to be. Consequently, the European idea of university is that of the title of PhD, of accreditation to teach, a title that is awarded collectively by professors. This idea is still alive and well, even among us in France. Thus, it is all the academics and all the PhDs of France who felt themselves humiliated and ridiculed when they learned that a Parisian sociology jury had awarded the title of PhD to a personality from the fashion magazines, apparently an extra-sensory and famous fortuneteller of the political milieux, for work on astrology. There is evidently a long road to travel from the simple recognized right to teach one’s own theses (having the title of PhD) to taking a paying job, especially if this means being recruited into an establishment, and it is here that the principle of good management and the necessity for good administration and competition among universities to attract the most capable person to occupy the office of President, and then the offices of deans, etc. find their legitimacy. This changes nothing about the basic principle: the meaning of the university institution is to prepare students to become doctors. Durkheim writes: “So it is now clear why examinations and grades remained unknown in Antiquity and in the early Middle Ages. This is because the idea would only have been born when the teaching masters, instead of teaching separately, formed a corporation having a sense of itself and subject to common rules” (p. 151, my emphasis). Durkheim does not use the word “identity” here but that is what he is talking about: a corporate group that has a sense of itself and draws this sentiment from the fact of its collective activity and the rules it adopts. We note that the collective identity of a university characterized in this way does not really belong to either of the two forms of solidarity distinguished by Durkheim in his thesis on La Division du travail social. This shared sentiment felt by academics of making a body cannot be explained by a link to the group that is founded upon mechanical solidarity (which rests on perception of a resemblance). Nor does it belong to a division of labor with the interdependence of organic solidarity. 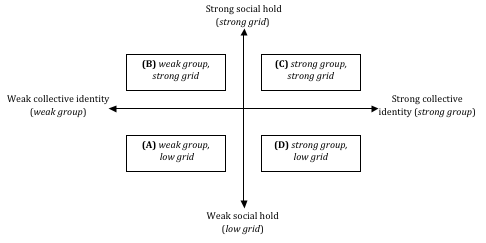 Douglas’ diagram is constructed around the idea that social life puts into play two dimensions. 1) The dimension of the social link (me/we). The social link is measured as more or less strong depending on whether the group is affirmed in the consciousness of individuals (whether they explain or justify themselves, etc., by invoking or not what they owe to the group, as what “we” should do). Douglas depicts this contrast as a horizontal dimension by distinguishing two possible tendencies. By contrasting milieux from this standpoint (with the polarity strong group/weak group, i.e. group with a strong collective identity/group with a weak collective identity), she rediscovers the classical typology in sociology: our social life is principally individualist, whereas the social life that appears the most distant from our own is that of a holistic group. 2) The vertical dimension of personal interactions (I/you/he or she). Here, we are interested in the actions by which people present demands to others (one has to have a reason or a title to give them) or justifications (when they are subject to reproach for not having lived up to the expectations of others). In a general way, the issue is whether the relation of X to Y (what X may demand or expect of Y) is governed by various circumstances already fixed by the tradition of the group (for example age, birth, profession, gender, etc.) or whether it is something that must be negotiated between X and Y (sometimes in a relation of force, sometimes in a relation of negotiation). 1) The world (A) of the enterprise culture celebrates the liberation of the individual and his initiatives, condemns the rigidities of tradition and hierarchical organization. The idea of freedom that is imposed is of “negative freedom” (in Isaiah Berlin’s sense). In practice, everybody is supposed to negotiate as one individual with another. This is the triumph of the social form of the “contract” over the social form of “status” (Douglas refers here to Henry Maine, Ancient Law). The world of status (C) represents from the standpoint of (A), the anti-model par excellence.Douglas stresses that this world (A) is not egalitarian in the sense that people want it to be in the milieu (D). The members of an “enclave,” for example of a small religious sect or a small community, watch over each other in order to be sure that nobody raises himself above the others. In (D), someone who tries to do so would be criticized, then chased out, or else there would be a schism. That is not how things go in (A). On the one hand, people who win are those who manage to form around their persons the most powerful coalitions or the most effective networks of influence. On the other hand, those vanquished by competition tend to be considered as victims of their own weaknesses and are expelled from the competitive world (or toward (B), the world of isolation, or toward (D), the world of dissent). In social form (A), there are losers by definition: not everybody can manage to find an honorable place there. The pathologies of (A) are thus on the one hand the need to exclude a portion of the population, and on the other hand the need to form networks of alliance and enter into ties of allegiance in order to survive. 2) In (C), the unity of the group is celebrated (faced with the external world) and so is the wisdom of its internal differentiation. The hierarchical principle permits making a place for everybody (but certainly not on the same rank!). There is not even any principle of exclusion. Here, rejecting someone is hard to conceive, it would take incredible acts of treachery or wickedness to justify a form of excommunication. When it is in good form, the group organized in this way develops a rich symbolic: it is by ceremonies, by images, and by social meanings that the group integrates and renews the social ties, in other words, the powerful feeling of being part of something that is worthy in itself, in short, a collective identity. When a group whose organization belongs to type (C) is going badly, its members tend to be rejected into (B) or into (D), but not into (A), which is here the foil, the anti-model. The pathologies of social form (C) are well known: when a society closes in on itself and becomes conservative, it is too concerned with its memory and not enough with its future; it falls into formalism (the ceremonies become tedious). One might have protest movements, whose characteristic form of organization is that of the minority enclave (D), or else, if only the ranks are kept, an evolution toward a bureaucracy where the call to transcendence of the whole over its parts no longer makes sense, which makes social relations slide toward a form of type (B). 1) The consciousness of a difference between the group and the rest of the world, between us and them: is it marked or not? Does it socially exist or not? The very fact of the ceremony, as long as it remains moving (as long as the participants attach a price to it, well marked by the entry of a new member into the group – Durkheim even speaks of his “initiation”), is an important affair. We are thus in a group characterized by a strong awareness of its boundaries (strong group). 2) The consciousness of a rule that is applied to our relations: are these relations fixed from the start by status or is it up to us to redefine them between individuals? To enter into the university institution, said Durkheim, is to enter into a “corporation having the feeling of itself and subject to common rules.” These rules are principally the parity of each degree, the hierarchy of degrees, and the promise of possible progression from the elementary degree to the superior degree. The university institution prospers when it can organize itself according to the strong grid. We are indeed in milieu (C). What does the diagram teach us about the way people understand the words “autonomy” and “competition” according to which they draw their ways of thinking in some form of social life? The idea that competition between individuals is always beneficial, and that it is always moral (for the losers are in reality people of little merit, since they have by definition made less effort than the winners) comes only to the heads of people situated in world (A). On the other hand, the idea that the best principle of social life is that of collegiality among peers for the definition of grades and their attribution can come only to those people situated in world (C). Such a world, with a strong collective identity and strong internal differentiation (strong group and strong grid), can certainly yield to emulation, but it can also include conflicts of precedence or primacy (when the “degrees” are badly defined), but it cannot conceive that a selection by exclusion could be just. Whoever does not find a place at some level of the overall organization ought to find one at another level, but in principle it should never be possible to be purely and simply thrown out of the system. Two conclusionsOne of the merits of Douglas’s diagram is to make the analysis bear on the irreducible conflict of “cosmologies,” visions of the whole, and on the inevitable misunderstandings that result. According to her, each of the four worlds is defined by its refusal of the diametrically opposed model of social relations. From the viewpoint of an institution of the “corporative” type (in the Durkheimian sense, which is entirely positive), the world (A) (the one where they speak of the management of “human resources”) is the absolute anti-model. And consequently, as long as the university institution is defined by the doctorate (the ultimate term that gives meaning to the students’ journey), it can only find its place in (C) or in (D), never in (A). On the other hand, someone whose forms of thought correspond to a social form of type (A) will have the opposite viewpoint: for him, a university that conforms to the European idea of university would be the very example of what should not be done under pain of sclerosis and waste. Nothing will be more justified than the mutation of the university into an enterprise. In this diagram, the box (A) must remain empty, for the only thing that is excluded, if we follow the analytical model borrowed from Durkheim and Douglas, is the possibility of having a teaching body (hence a university in the proper European sense of the term) that is organized according to the viewpoint proper to (A). In effect, according to this viewpoint, the very idea of a teaching body is unintelligible or inadmissible, collective action could only be an ensemble of personnel, to which should be applied the methods tested in good management of “human resources”. Originally published in laviedesidees.fr. Translated from French by Susan Emanuel. Isaiah Berlin, “Two Concepts of Liberty”, in The Proper Study of Mankind, (London: Pimlico, 1998).- Mary Douglas, Risk and Blame: Essays in Cultural Theory, (London Routledge, 1992). Mary Douglas, Steven Ney, Missing Persons: A Critique of the Social Sciences, (Berkeley, University of California Press, 1998). Émile Durkheim, L’Évolution pédagogique en France, (Paris: PUF, coll. “Quadrige”, 1999). The Evolution of Educational Thought: Lectures on the Formation and Development of Secondary Education, trans. Peter Collins, (Boston & London: Routledge Kegan Paul 1977). Albert Hirschman, Exit, Voice and Loyalty, (Cambridge MA: Harvard University Press, 1970). Simon Leys, “L’idée d’université”, Commentaire, n°114, vol. 29, 2006.- Henry Maine, Ancient Law (1861), reprinted (New York: Dorset Press, 1986). Charles Sanders Peirce, quoted by Christiane Chauviré, Peirce et la signification, (Paris: PUF, 1995), p. 57. See on Books and Ideas the file devoted to academic localism, in particular the article by Olivier Godechot and Alexandra Louvet, “Academic Imbreeding: an Evaluation”, 22 April 2008 (http://www.booksandideas.net/Academic-Inbreeding-An-Evaluation.html). In this paragraph, the terms in italics in quotations are my emphasis. See also Emile Durkheim, The Evolution of Educational Thought: Lectures on the Formation and Development of Secondary Education, trans. Peter Collins, (Boston & London: Routledge Kegan Paul 1977). “If people are organizing differently, they are thinking differently about organization and also about morals, society and identity,” quoted in M. Douglas, Missing Persons, p. 110). Mary Douglas, Risk and Blame: Essays in Cultural Theory (New York: Routledge, 1992), p. 224.